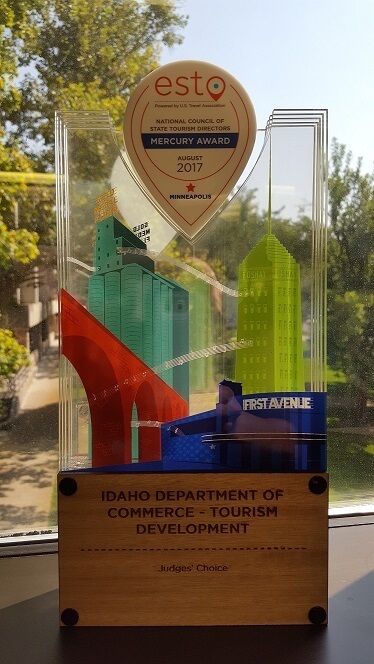 BOISE, Idaho – August 31, 2017 – The Idaho Department of Commerce – Tourism Development received high praise this week at the annual ESTO (Educational Seminar for Tourism Organizations) conference held in Minneapolis, Minnesota, bringing home another national award. Idaho Tourism won the National Council of State Tourism Directors Mercury Awards Judges’ Choice award for its successful 18 Summers campaign. This ‘best of show’ recognition is worthy praise for Idaho, whose tourism marketing budget is smaller than many other states. The Mercury Awards recognize excellence in destination marketing on the state level. A judging panel of business leaders from companies including JPMorgan Chase and Hilton selected the winners. Initially launched in 2014, the 18 Summers campaign focuses on sharing the value and importance of taking family vacations and spending time together. Boise-based advertising agency Drake Cooper was the artistic orchestrator behind the campaign. The ESTO conference is organized by the U.S. Travel Association and focuses on providing educational and networking opportunities for travel marketing professionals from across the country. The awards are held annually on the last night of the conference. See the full list of 2017 Mercury Award winners here.